The washing machine is one of the greatest inventions of the 20thcentury. Back in the day, women had to spend hours boiling water, hand scrubbing clothing, hanging it out to dry, ironing, folding, and finally putting it all away, only to start all over again. The modern appliance transformed women's lives, letting them get out of the laundry room and in to the work force or anywhere else they preferred to be. It’s a miracle product. That said, it can’t clean everything and the machine can’t read the tag on an item to see if it’s safe to stick in the wash, or choose the right settings without some help from us. Those beautifully delicate items covered in beading or embroidery can be destroyed in the washing machine, especially if they are glued on instead of sewn. Similarly, take care washing anything made with lace, which can rip or tear in a washer, especially if it rubs against clothing that has hooks, buttons, or zippers. Hand wash or dry clean those items, instead. The wire and hooks and eyes can damage the interior of your washing machine, turning a $30 bra into a $600 mistake. Instead, either hand wash your lingerie or invest in a protective mesh bag to keep your bras and machine safe. Don’t have a mesh bag? A pillow case will do the trick. While most of us wouldn’t intentionally wash our keys or change in the machine, almost everyone has accidentally left a few coins or a spare key in the pocket of a pair of jeans at some point. If the keys or coins stay put, it can be a harmless mistake, but if they get loose they can do a lot of damage. "[Coins] can damage the fins on the drain pump if they make it past the filter," James Peters, KenmoreLaundry Product Manager, told Business Insider. They could also get stuck in the washing machine’s drain, blocking the water, damage the drum, or even shatter the glass of a front-loading washer. Luckily, the solution is easy: simply check pockets while you load the machine. While you can wash some sneakers in your machine, be aware that it can shrink the shoes or reduce some of the qualities that make them able to take a beating on the road. Also keep in mind that shoes with leather accents should never go in the machine as it can damage the leather. While it’s safest to hand wash your expensive running gear and letting them air dry, if the tag says they're machine-safe, Livestrong suggests removing the insoles and putting each shoe in a separate pillowcase and then air drying. If you spill gas, paint thinner, or another combustible solvent on your clothing, do not stick it in the dryer. The heat could cause the stain to combust and cause a fire. Instead, according to Carolyn Forte, director of the Home Appliances & Cleaning Products and Textiles Labs at the Good Housekeeping Institute, who spoke to Prevention, spot-treat the stain with a solvent-based stain remover (like Spray n’ Wash), let it sit for at least ten minutes, and then machine wash alone, so it doesn’t transfer the toxic stain, and hang dry. Alternatively, The Spruce recommends mixing two-parts baking soda with one part water and rubbing the paste into the stain and then wash and hang dry. Otherwise, hand-wash the item in hot water with liquid detergent, and then hang dry. As every parent knows, baby socks disappear with an alarming frequency. According to HGTV, though, one culprit may be the washing machine. Baby socks are so darn tiny, that they can be sucked into the hoses and vents on your washer and dryer. Not only does this mean having to purchase a steady supply of ridiculously small socks, but can clog the machine leading to flooding and costly repairs. It’s worth buying a mesh laundry bag to safely corral the little things. While we all love cuddling with our beloved pups and favorite lap kittens, the hair they frequently leave behind is less than adorable. While your first instinct may be to immediately chuck the hair-covered pants in the washer, it’s worth taking a moment to remove the hair first with a lint roller or brush. William Bittner, vice president of North American sales at Speed Queen, a company that makes both commercial and residential washers, told Consumer Reports, that if you chuck it straight in the washer, the hair gets wet, clumps, and can stick to the sides of the washing machine spreading the hair to your next load of laundry. Plus, all that hair can run down your drain, clogging pipes. Another option for removing pet hair from clothing is to stick it in the dryer first where the steady motion, heat, dryer sheet, and lint trap can remove and capture the hair. Your washer and dryer can do a lot, but overstuffing tends to cause bigger problems than forcing you to do a second load of laundry. 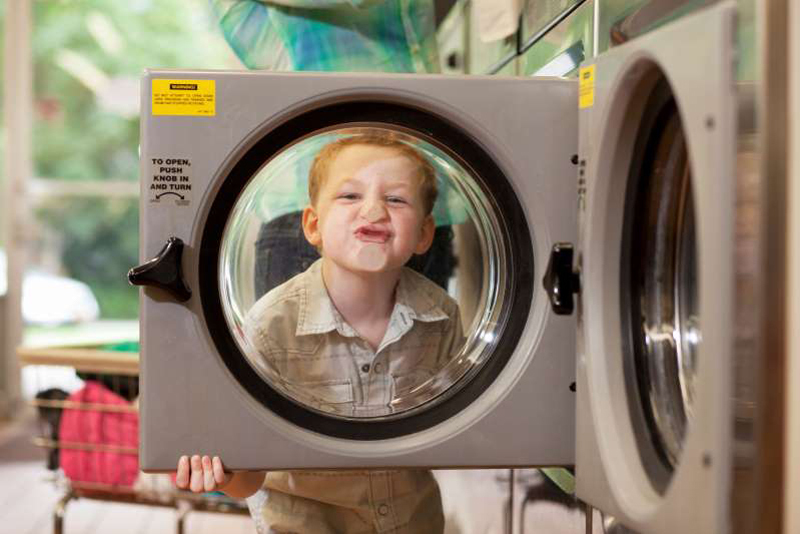 Overloading the machine means the washer can’t clean your clothes properly, and the dryer won’t be able to generate air flow to dry clothes evenly. Plus, overloading can lead breakdowns. Not only do heavy loads strain the drum belt and bearings, but they can cause the motor to overheat and burn out. Check the manufacturer’s suggestions for your particular model’s capacity and consider taking big items like comforters to the dry cleaner or laundromat. Suits tend to be high-priced special-occasion clothing made of high-quality fabric. Protect your investment by always dry cleaning your suits, as even the delicate cycle can be too much for the clothing. Instead, bring it to the dry cleaner. In between dry cleaner drop-offs, use a steamer to de-wrinkle your suit.